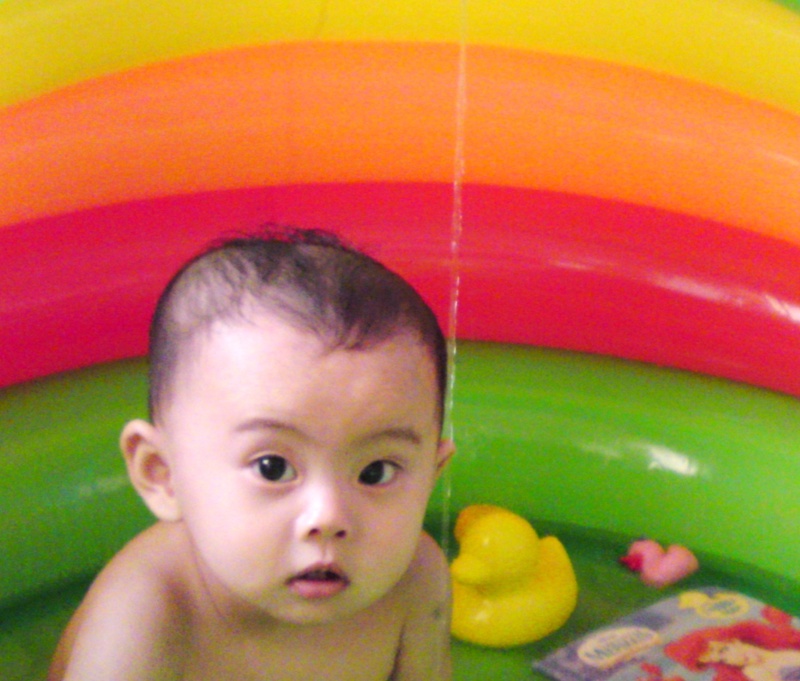 Posted byMei 25 April, 2011 14 May, 2018 14 Comments on How to Shower your Eczema Child? FAQ 1: How often to shower baby? The general guide is not to lose moisture through showering but to retain or increase moisture from the routine. Frequent showering will lose moisture but for babies whose itch is triggered by heat and sweat like Marcie, she showers about twice a day. Once in the morning to get her off to a fresh start and once before bedtime to (hopefully) reduce scratching at night. FAQ 2: What water temperature for the baby bath? Lukewarm is recommended; warm is a no-no, again due to loss of moisture. Heat actually temporarily numbs the skin and reduces sensitivity of the itch nerves (from what I read). However, its permanent effect is a loss of moisture. FAQ 3: What bath lotion to use? Soap-free and perfume free. I use Dermaveen Colloidal Oatmeal bath oil (you can also try Aveeno’s) which is soap-free, moisturizing, non-greasy, lower skin pH and seals the moisture after baby’s bath. FAQ 4: How long to bathe? Usually soak for 10-15 minutes. As your baby gets older, she may no longer fit into the bath tub or prefers to bathe standing. Now Marcie will sit in the bath tub if she has toys to play or we blow bubbles to keep her amazed and seated in the tub. Don’t slip if you have just used the colloidal oatmeal bath lotion! Wrap baby in towel, pat dry, don’t rub towel against skin. Moisturize immediately (you can refer to this post on the choice of moisturizer). Update: About a year and half after this post, I’ve interviewed Dr Jennifer Shu and you can refer to her advice for bathing for babies with eczema here. How do let the baby day time naps. She doesn’t sleep at days. Is your baby sleeping at night? Mine sleeps about 10 hours per day (including naps), from birth (so considered not enough sleep as an infant). If she’s not sleeping due to itch, then the eczema has to be treated – if there’s no rash, but still itch till she can’t sleep, may have to check with doc if she needs any non-steroidal prescription for maintenance. O.w. I usually tire my tot out with activities, establish a routine of shower, activity, books and sleep – whether it’s naps or at night. And of course, moisturizing, keeping room cool and comfortable, if there’s dust mite allergy, take steps to reduce dust mite. Hope you’re getting some sleep! I cannot contact you through “contact me” page. It didn’t allow me sending security code. I regularly read your blog since my baby was diagnosed as eczema. Fortunately, I knew the trigger quickly but still difficult to control. I think her skin is dry even though I use the suggested steps. I am using ‘aveeno moisturizing wash’. It is not bad but I don’t know if its better if I add some oil, do you recommend any oil in addition to oatmeal bath. Now she is 7 month old and very playful. It means I rarely have a chance to put her lotion on after the bath. I still tried to put lotion, however. I took the skin prick test at NUH, see http://eczemablues.com/tag/skin-prick-test/ for more SPT-related. I use dermaveen bath oil for Marcie, oat-meal based, haven’t tried other brands at home though she uses QV wash/ Physiogel cleanser in school. Hope to meet up with you soon! Hi, thanks for the reply. I brought to national skin centre three times, but they refused to do skin pick because she was too young ( less than 1). Now, I may want to look into the type of laundry detergent . Any brand to recommend? Tks. Hi, my girl keeps scratching her stomach, back only at night. She could not sleep well at night. I am thinking could it be the body wash? I tried to use cetaphil but no use. I also use steroid cream and a1 cream but no use. I went to national skin centre twice but they keep asking me to moisturise the skin. What should I do? May in know where u take the skin pick? Thanks Kate 🙂 Glad that natural oils are working for your child! A doctor recommended oatmeal for my tot when she’s fairly young and since she seems to like it, we’ve been sticking to it. Of course, no need to use a brand if no need to, save money too! Why use name brands? We use diluted tea tree oil or lavender oil in my daughter’s bath. We don’t need any unnecessary ingredients! Also, swimming in a chlorine pools helps a lot, but it is temporarily unbearable from when she gets out of pool to an hour after bath and shortening application. Hi Polly, Dermaveen is available in Watson, I used the bath oil (it’s usually one/two shelf space lower than eye level) same shelf as QV & Physiogel. Aveeno is not available in Singapore, popular in US where they don’t have that many australian products. Hi, I stumbled upon your blog while surfing for products that are good for children with eczema, and am interested in trying out the 2 bath products that you mention in this post. Are they available in Singapore, or did you buy them online? For the Dermaveen one, the website says it’s available in Singapore but doesn’t say which retail shops you can buy from. For the Aveeno one, it looks like they have a range of different types of bath lotions/body and shampoo products; is there any particular one you would recommend? Would appreciate any advice you can give. Thanks! I also read that showering reduces the bacteria, clears the dead skin and allows the steroid to work better.